As an Idaho couple continues to develop their crowdfunded solar roadway prototype, France is now leaping ahead with its own solar roadway project. Last week, the country's minister of ecology and energy, Ségolène Royal, announced the government would pave 621 miles (1,000km) of road — about the distance from Boston to Cleveland—with photovoltaic panels in the next five years, Global Construction Review reported. The project aims to supply electricity to 5 million people—about 8% of France's population. The first test panels will be constructed this spring. 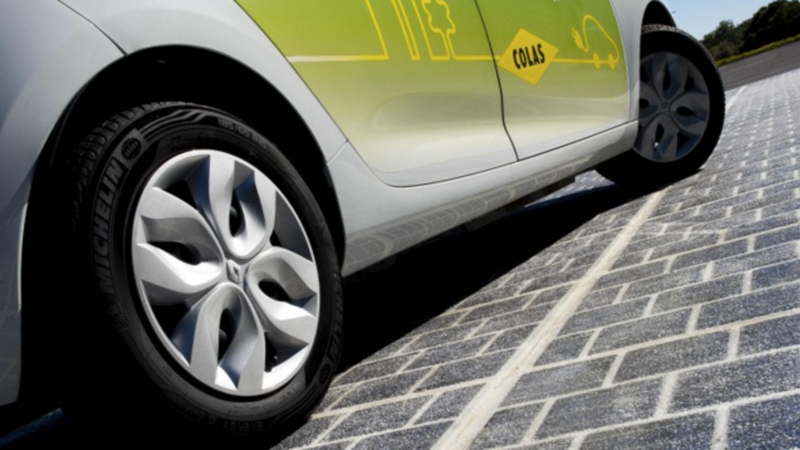 They're being produced by a French company called Colas, which is calling the project Wattway. The panels are composed of stacked photovolatic cells that "ensure resistance and tire grip." They also don't require destruction of existing roadways; instead, they can simply be added on to them. Both the Idaho and French projects will be months behind the first active solar roadway, unveiled in the Netherlands, which opened in November. The locations of the French roads that will be equipped with the panels have not yet been determined, a Colas rep told me. The cost of the project will depend on where and how they are ultimately installed, she said. All three projects are being spurred by the plummeting cost of solar; panel costs are now projected, by at least one source, to continue to fall an average of 10% each year.